It's always a good thing to go back to your old stomping grounds for a few cold brewskies with some friends. While my "old stomping grounds" has changed a couple times throughout the years, I can definitely say that my most common watering hole these days is Sammy's Grill on Highland Road. It's always good to have a place where you have the menu memorized and the waitstaff knows you by name and drink order. 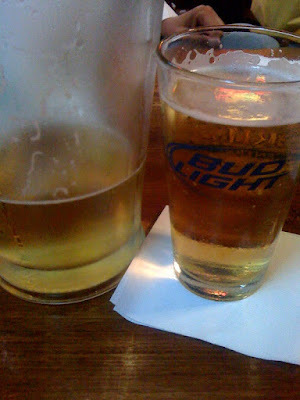 While I would prefer if they had a better tap beer selection, I certainly can't argue with a cold pitcher of Bud Light on a warm Baton Rouge evening. Mmm... This Bud's for Me! I know I know, how can a food and drink critic such as myself actually give praise to Bud Light? Well, I really can't. Not the beer. But, I can always praise the company that I drink beer with! On this particular day I was joined by some former teacher colleagues of mine from LHS, Rachel Saltzberg, Brandon Levatino, and Brent Broussard. I got to listen to them talk about their new teaching gigs and how things in education have gone since my "retirement" back in May. Mix in a few pitchers of beer after a high school football game, and you have a good time at Sammy's! I noticed a chef's special on the board that I had never seen before so it only made sense that I give it a try. The chicken pot pie soup featured tender chicken in a creamy soup with peas and carrots. It tasted just like the stuffing of a chicken pot pie, which made it weird to eat as a soup. The soup's consistency was rather solid for a soup and really belonged in a bread bowl or possibly even between two slices of bread like a chicken salad sandwich. I really enjoyed the flavor, but overall it was a just a little odd. Oh well, I still ate the entire bowl and left Sammy's satisfied and happy to spend time with some great company! Sammy's! - sorry, me again - I had to come back to read since I didn't have time yesterday when I left that note. 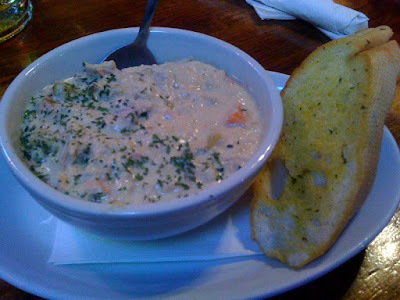 I haven't been to Sammys in forever - that soup sounds really good as I do love pot pie.